If you're looking for extraordinary results without having to go on a dramatic diet or spend countless hours exercising to lose inches and pounds, then this supplement is what you’re looking for. 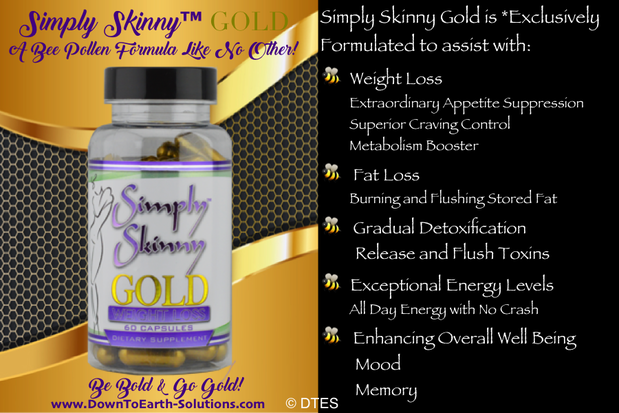 ​Simply Skinny® Gold makes weight loss "Simple"! Simply Skinny®GOLD bee pollen dietary supplements can prove to be the best asset you own for weight loss! If your looking for extraordinary results without having to go on a dramatic diet or spend countless hours exercising, then this supplement is what you’re looking for. It makes weight loss "Simple". Simply Skinny® products are exclusively formulated as your solution in assisting in the transformation and reshaping of your body without having to diet or exercise. Our Simply Skinny® GOLD not only provides you with an exceptional lasting energy with no jitters and better yet no crash, this bee pollen dietary supplement makes eating less much easier because it can curb the appetite significantly and speeds up the metabolism. It’s the Simply Skinny® GOLD matrix of both natural and man-made ingredients that are responsible for it’s extraordinary appetite suppressing action. As a very powerful appetite suppressor, you will no longer have to fail another diet, wreaking havoc on your self esteem. Instead, you will be able to have more control of when you eat and how much. The metabolism boosting action serves to increase your energy levels, helping you stay alert and active throughout the day. Choose Simply Skinny® GOLD if you want help with transforming your body into a fat-burning machine. No longer will those problematic areas be cause for concern, as Simply Skinny® GOLD targets all these zones, including the belly, hips, thighs and arms. ​Recommended Use: As a dietary supplement take  in the morning with breakfast and 8oz of water. Due to the strength of the product, assess tolerance by taking  capsule once per day for the first few days. *These statements have not been evaluated by the Food and Drug Administration. This product is not intended to treat, cure, prevent, or diagnose any disease.